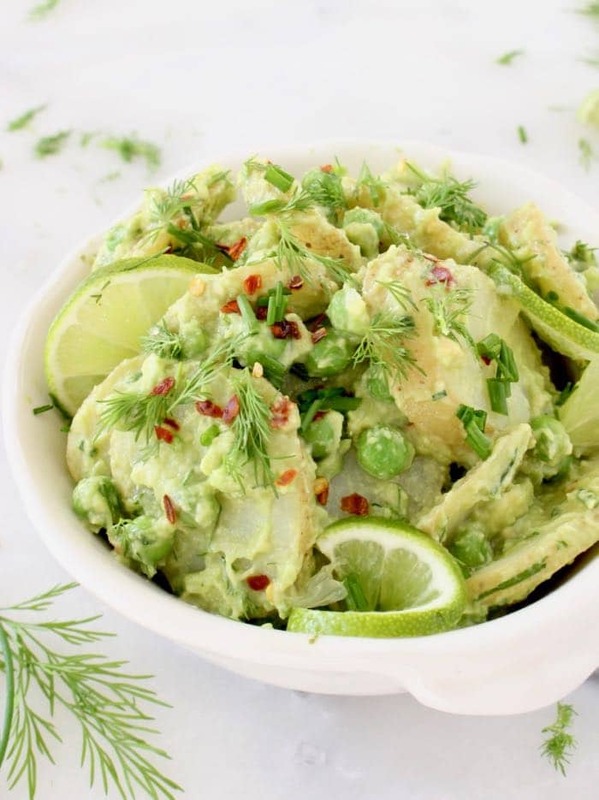 No mayo, healthy and vegan avocado potato salad recipe with lemon avocado dressing, fresh dill, scallions and chives. 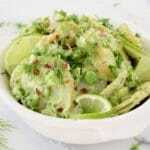 Add a handful of green peas to boost the protein content but also because they go really well together. 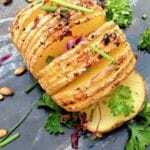 One of the best potato salads you’ll ever make! 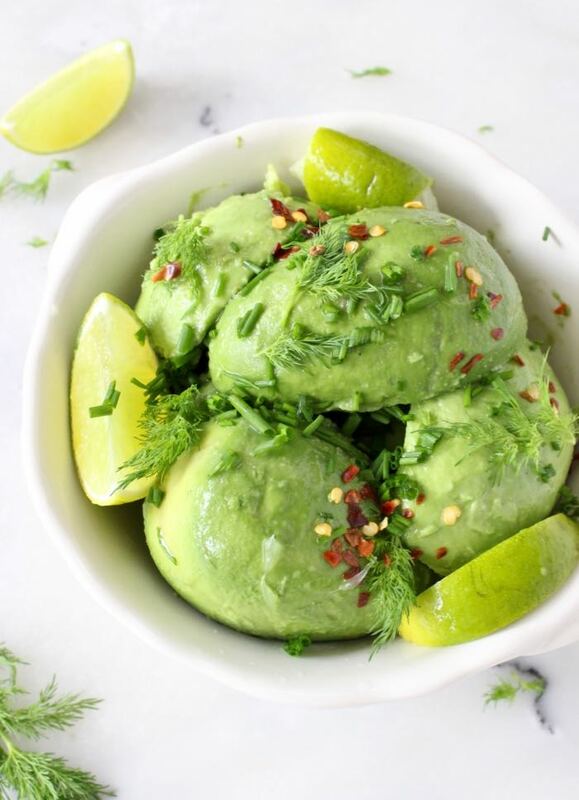 A simple concept of slicing and boiling potatoes and while those cool off you mash some perfectly ripe avocados with lost of freshly squeezed lemon or lime juice, a bunch of fragrant dill and sweet spring onions. Season with sea salt and mix in some green peas to make a meal of things. 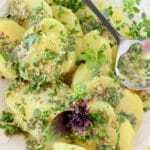 I’m really fond of fresh dill especially in potato dishes, some people find it a little overpowering and If that’s the case then cut down on the amount or replace it entirely with fresh cilantro /coriander or watercress, even chopped up dandelion greens and arugula would make a nice addition. This salad reminds me of my favorite creamy potato salad from my childhood (minus the mayo of course) that also has cooked carrots and always served with tiny pickles or cornichons. I hope you’ll give it a go because it’s too good to be missed. Travels well in a cooler, so bring it to your next garden potluck party! note worthy: avocados are a great source of fiber, lutein and potassium, great for the heart, eyes and healthy skin. Load up! P.S. As always, If you make this recipe please come back here to rate it and tag us with #VeggieSociety on Instagram. 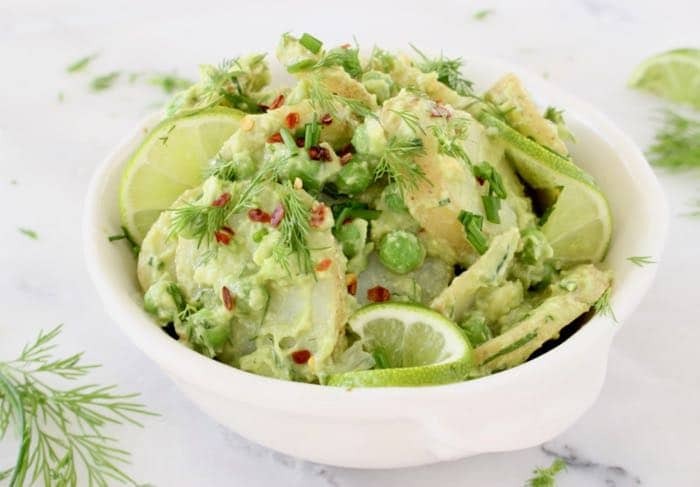 No mayo, healthy and vegan avocado potato salad recipe with lemon avocado dressing, fresh dill, scallions and chives. Rinse and slice the potatoes into 1/4 inch slices. Cover with cold water and bring to a boil. Season generously with sea salt at this point, the water should taste like sea water. Cook for about 10 minutes until tender but not mushy. Drain the potatoes in a colander and allow them to dry very well in their own steam then allow to cool. Meanwhile slice the avocados and scoop out the flesh. 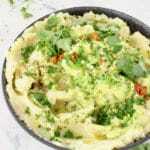 Transfer to a large mixing bowl and mash together with the lemon or lime juice. Mix in the scallion and chili pepper and season to taste with sea salt. 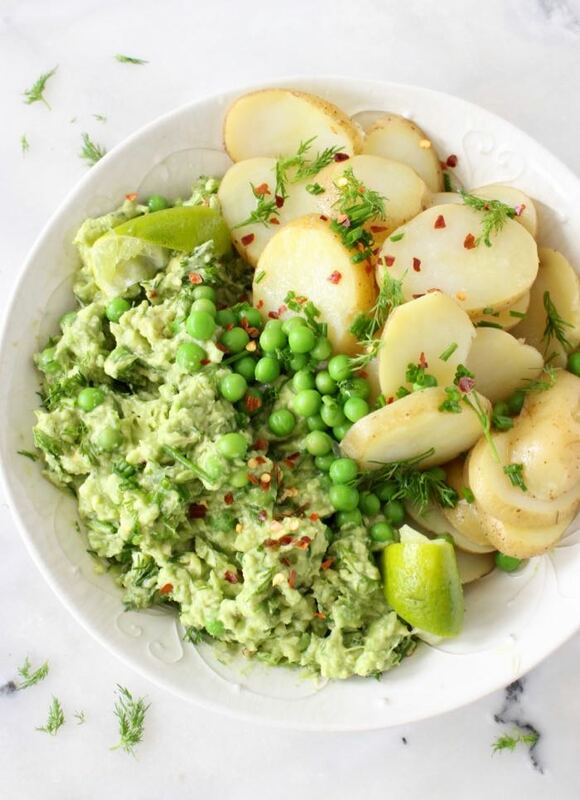 Add the potatoes to the bowl with the avocado together with the green peas and dill. Use a spatula and fold them together with care as not to break them. Taste and adjust seasonings again with more lemon juice and sea salt. Garnish with the chives and serve at room temperature or chill for later use. Reserve about 1/2 cup of the water from the potatoes so you can use it to stretch out the dressing later if need be. This salad was incredibly creamy and flavorful, will make it every chance I get. Thank you, loving all your vegan recipes! Your description mentions dill but I don’t see it in the recipe. How much do you put in? thank you for this, I am allergic to eggs, so mayonnaise and salad dressings are not my friends. this looks amazing, I can’t wait to try this. Your description mentions dill but it’s not in the recipe. How much fresh dill do you add? Looks great! My husband can’t have avocados, do you think I could replace the avocado with 1/4 cup white beans? do you think that would work or do you have another substitution?